My cat loves these he's had them for three years now and they have lasted this entire time he carries them everywhere and loves sneaking them into his water bowl when I'm not around. Highly recommend this toy. Batting Around And Retrieval Fun for Kitty! My kitten of 8 months absolutely loved pink jumbo ball toy. He is a Burmese and like a dog. I would throw it from my bed and he would jump on bed to give it to me and start over. Toy uses a good bit of energy which both my cat and I appreciated. I am going to order 2 more, once I get my bills paid off. They're pretty great, honestly. Their size makes it hard for my kitty to get them stuck in hard to reach places like under the oven and in between furniture. So yeah, I am glad I made this purchase and I would recommend it to anyone else. I have two Ragdolls and they just love these bad boys! The only problem is that they tear them apart and they make a magnificent all over! They would be 5 Stars if they didn't come apart so easily. They're worth the mess! These are the cat's favorite toy. She goes nuts batting them around. Although they still get lost under furniture etc., the large size is much better than the small ones. my cat will ONLY play with jumbo tuffs. They are too big to swallow, and best of all, they DON'T fit under the fridge! He fetches them like a dog and will wander the house aimlessly meowing if he loses one, so I order them in packs of 3 or 6. I've had cats for 40 years,this is the best quality toy for the price out there. We will be customers for as long as there are the pitter-patter of little paws in our home. Even better as they are harder to hide! I really like these larger balls. 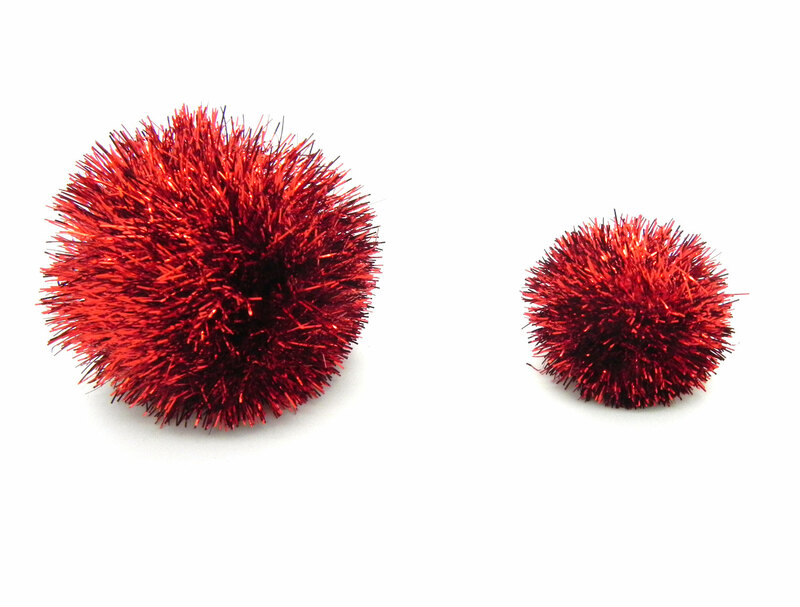 I have room under the door that lead to the utility room and these do not go under the door as the smaller balls do. Cats both love these balls as well! I needed something to keep my cats busy these are just the ticket. My cat loves to play with sparkle toys, but the ones I bought from the local superstore were so small that they always rolled under the couch or the refrigerator. 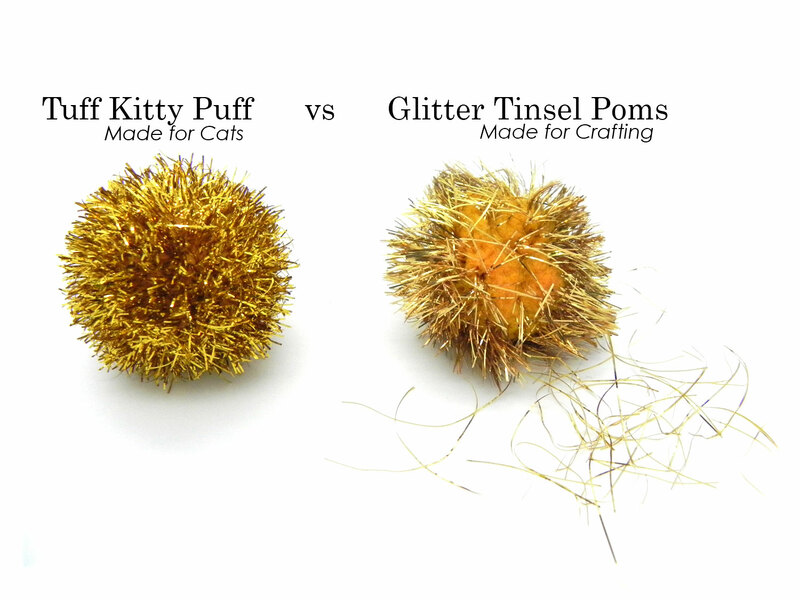 The Jumbo Tuff Kitty Puff Sparkle Ball is perfect because it's much easier to keep track of. It is also a quality toy that is holding up very well to my kitten's vigorous play. I'm so pleased to have found these great toys! My grand-kitties love, love, love the white Puff Sparkle Balls. They play until they just crash. They get back up & start all over again. It's so much fun to watch.